Yesterday I watched Safiya ride away with Mr. S. to his work for the day. It was her first big bike ride and she poked her head into our room at 6am, dressed and ready to go. She was so excited, and a little scared. This is the girl who only fell in love with bike riding two years ago (before that there was a lot of "I just don't like bike riding!") and is tall enough to require a "big bike". To go from riding around the block to riding 18k in one day is a big deal when you're ten years old. Mr. S. said she handled it with aplomb: tired, but not a single complaint. Safiya had been asking for a longer bike ride and when Mr. S. suggested this one, she had latched on to the idea with enthusiasm. It had been her own goal, and she had done it. I tried not to embarrass her with too much high-fiving when they got home. Two weekends ago I had the idea to do our first family bike ride, which included Zinadine on his training wheels. I remember being optimistic as we loaded up the bikes on our very optimistically purchased bike rack to make our optimistic way to a big park with a rec trail. It was one of the first gorgeous days and.....it went hilariously not that great. We made it maybe 250 metres until we had to turn around. Presented with this challenge to my expectations, Mr. S. and I took turns going slow with him.....very slow.....and decided to enjoy the sound of the nearby creek and the birds and talk about what we were seeing in the park. 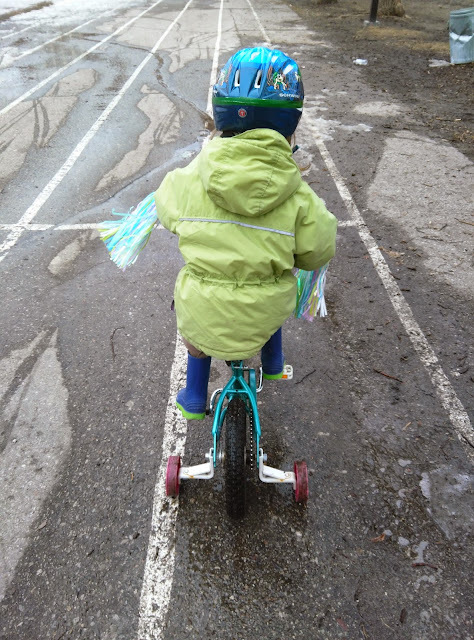 The end result was that Zinadine said he liked biking and that he'd do it again and that we all needed freezies from the corner store. Now, the point of the story isn't that Safiya is ten and Zinadine is five. The point is that Safiya was also once five and behaved very similarly. The point is also that apparently I need reminding that my expectations as far as skill aquisition have very little bearing on reality. We can try out different things and make gentle suggestions (and sometimes bribes), but what Mr. S. and I learn from the kids over and over is that true joy of accomplishment only comes from the inside. So, sometimes it works and sometimes......sometimes you are reminded that everyone gets there at a different pace and sometimes a different method, to be determined by them. And sometimes you need freezies.